Tyler Cooper, MD, MPH, President and CEO of Cooper Aerobics, certainly practices what he preaches with his supplement recommendations. 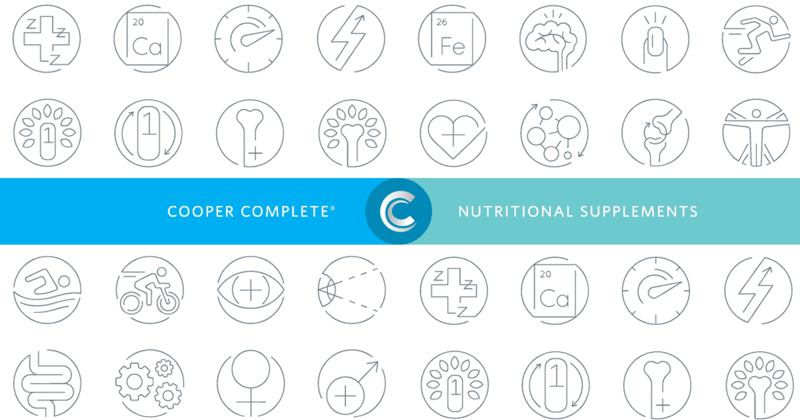 Dr. Cooper maintains a healthy diet and exercises daily, but even he relies on Cooper Complete® nutritional supplements to help make up for any diet shortfalls. “I always tell my patients that supplements are not magic pills to make you feel better. That’s not their purpose. They exist to do what their name says, supplement your diet in a positive and beneficial way,” says Dr. Cooper. If you’re new to supplements or just don’t know where to start, keep reading. Dr. Cooper shares what Cooper Complete supplements he takes on a daily basis and what he recommends most often to his patients. The Healthy Body Pack, which Dr. Cooper takes daily, contains a multivitamin (Basic One Iron-Free multivitamin) and two fish oil capsules (Advanced Omega-3 fatty acid). These supplements are conveniently packaged together in daily serving packets and provide a potential multitude of health benefits for your brain, heart and even for inflammation. “Studies have shown, among other things, a decrease in oxidation of LDL (bad) cholesterol and a decrease in inflammation measures when taking fish oil and a multivitamin,” explains Dr. Cooper. One of the biggest challenges is getting people in the habit of taking their supplements daily. However, the Healthy Body Pack makes it easy. Although, he recommends taking your supplements after you brush your teeth. Linking to this daily activity is a great way to establish a new habit. You can also place a Healthy Body Pack in your pocket or purse to help you remember to take it later. “Most of my patients are busy professionals and the Health Body Pack packaging makes it simple to take the supplements with you so you can take them at lunch, in the office, eating out or when traveling,” says Dr. Cooper. Vitamin D food sources are limited to the point that health professionals, including at Cooper Clinic, say it’s difficult to get enough vitamin D through diet alone. Also, sunshine is a great source of vitamin D, but sunscreen often blocks absorption. “Many patients we test at Cooper Clinic are low in vitamin D,” explains Dr. Cooper. “Typically an individual needs a minimum of 50 mcg (2,000 IU), which is what’s in our Cooper Complete Basic One multivitamin.” If that’s still not enough based on the patient’s lab work, he recommends an additional vitamin D supplement. Research shows maintaining proper levels of vitamin D can help decrease the likelihood of breaking a bone or developing osteoporosis. Additionally, vitamin D deficiency has been linked to potentially helping prevent certain types of cancer, diabetes, arthritis, depression and heart disease. Factors such as skin tone, body weight, and sun exposure can all play a role in vitamin D levels. Once you’re on a vitamin D supplement for several months, Dr. Cooper recommends checking back with your physician. Have them retest your blood retested to see if your vitamin D levels have reached an optimal range. CoQ10 – If you’re taking a statin medication, Dr. Cooper recommends taking Coenzyme Q10 (CoQ10). Statins can potentially have a negative effect at the mitochondrial level for which CoQ10 Ubiquinol can help prevent and thus, minimize the chances of developing associated muscle aches and pain associated with statin side effects. Iron – If blood tests reveal low iron, Dr. Cooper has a supplement recommendation of Cooper Complete Original With Iron multivitamin or Basic One with Iron multivitamin. He also recommends this multivitamin to women in their childbearing years, as they lose iron with their monthly cycle. For the patient who needs more than the 18 mg iron contained in these multivitamins, he suggests an iron supplement. Click here to shop the entire line of Cooper Complete supplements. As a reminder, your physician understands your health profile best, so it’s important to talk with them about which supplements are best for you.